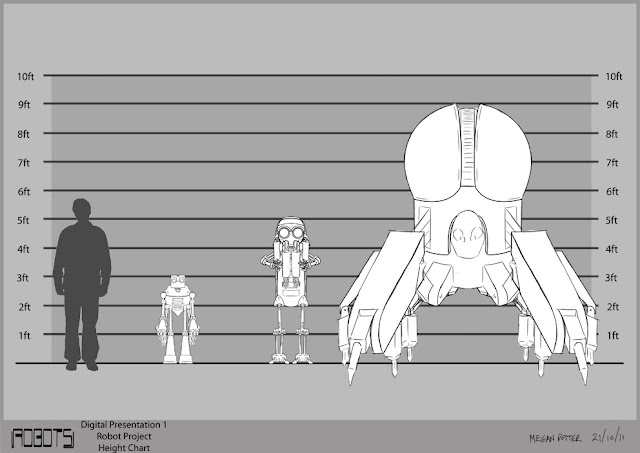 Here, for comparison, I have posted my original height chart with my initial deigns, and then the final height chart with my final designs. And then below I have posted the design notes that I had compiled whilst studying the work of professional concept artists for my mood boards; I hope that my robots reflect what I had learned during my research. The Good: Robots that are built to serve humans or provide intelligence. Also robots that feature prominently in the piece and so need to be designed in such a way that they fulfil the needs of an audience as a protagonist- for example, showing a unique personality through unique features, having an expressive face/ facial features. Good robots are generally more human looking in order to make them seem trustworthy (NS5, C3PO), they tend to be more brightly coloured or a more attractive metal. Robots that are built for combat. Also robots that are the main antagonists of the piece and are designed to make the audience feel threatened or a dislike for them. Bad robots tend to have claws or weapons for hands, red lights, are more angular/ sharp in shape, more neutral in colour or a more harsh metal, and they are usually more creature like in appearance to distance them from the audience. Red is a recurring colour for combat or opposing robots because it is a threatening colour, by simply including the colour red in a design, one can drastically change the audience’s interpretation of the robot. Examples of this include i-robot, the film features the brand new NS5 models of robots, which are sleek and clean in colour, they have an outer shell that is soft and the face is moulded to resemble that of a human face, all this is in aid of making the robots appear upscale and safe, and to make the humans have complete trust in them. But as soon as they light up red, their robot skeleton shows through and their face becomes emotionless, they become instantly threatening even though their basic design remains the same. Another example is The Incredibles; the first version of the Omnidroid (the film’s main robotic antagonist) is lit with a blue light and Mr Incredible defeats it without too much difficulty, the improved version is lit with a red light, just from this change the audience automatically registers that this robot, though almost identical in design, is much more of a threat. The Ugly: Robots that are designed in such a way that their function is obvious as they must show their purpose in a very short amount of screen time. They are only there to fill the world and make it believable as a functioning society, they are generally designed without eye catching features so as not to distract the viewer’s attention from the featured robots. Ugly robots are fairly simplistic in design, their design ‘matches’ or complements the designs of other, more prominent, robots or surroundings in order to make them believable as a part of the world. They often have logos or company colours painted/grafted onto them. Designers use things from the real world- such as nature or art movements- to influence or feature in their designs, this is so that the designs become more plausible to the audience and so the audience can connect to the designs because they have already seen them before. Prominent robots all have a ‘face’, and human/ plant/ animal features/ designs so the audience can identify/ connect with them. Most Robots are built either using or greatly resembling the human, or animal, skeleton; this is not only to make the robot relatable to the audience (though it can also serve to make the audience uncomfortable as a lot of humans find it slightly disturbing to see themselves represented without their skin); but it is also because biologically evolved skeletons have perfected the art of movement and so using these same joints and frameworks makes the robots movements as versatile as that of the human or animal it was based from. Common design elements include a revealed spinal column, spider or crab like legs (more often on bad/combat robots), lenses for eyes, lights, some robots have legs (more often the featured robots) whilst others have wheels (more often the ‘ugly’ robots), exposed parts or wiring, grills. Though it is much more common to simply design robots to be bare metals, some robots wear or include exterior materials, for example the Stitchpunks (which are the protagonist robots) in ‘9’ wear varying designs of cloth which serve to reflect the times at which each of them were made and also indicate their haphazard creation, and the Beasts (which are the antagonist robots) wear/ are built to include skeletal parts to further emphasise their threatening nature. In the past, robot designs were generally more bulky, often because the lack of computer generated effects meant that the robot’s design had to accommodate the actor inside of the costume, and because technology of the time was also big and block like these designs were the norm. They were mainly built of plain industrial metals, some were rusted and others were a harsh grey- obvious exceptions include C3PO who was a rich and exotic gold, the sleek appearance of which indicated the futuristic time that he was made. 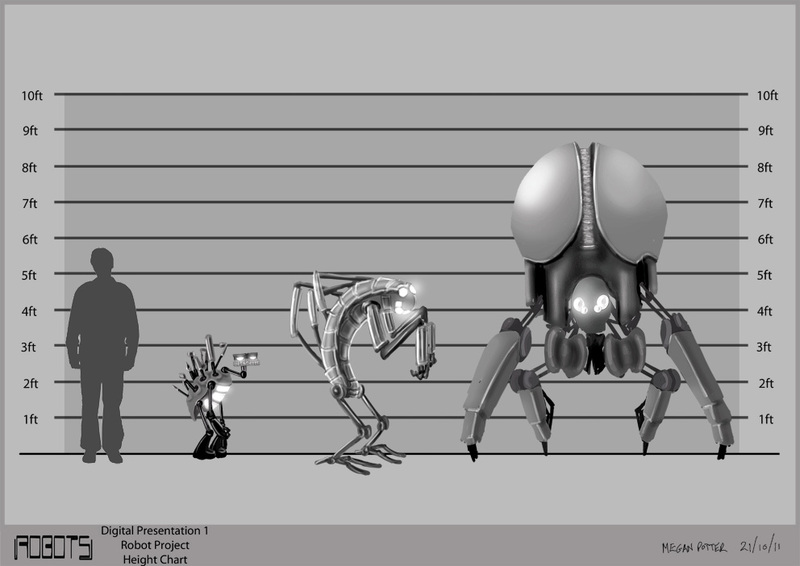 Newer robot designs have a lot more freedom as they can be created and animated fairly easily through techniques such as motion capture. They are generally smooth and sleek in design and can vary from slim and streamlined in build, to more sturdy and powerful, or a delicate mixture of grace and power. The materials have been modernised from the old metal casing and frantic wiring to the more popular materials of today such as carbon fibre and metals like platinum, and stainless steel- metals that we see in everyday objects such as laptops and mobile phones. This sleek style has become the norm for todays public and so ‘old’ robots within todays films are designed to model the style of earlier robots and technology to communicate their age. Cars and Computers/ Hardware today are often made with a combination of metals, and polycarbonate fused with carbon fibre (the smooth white material). The Apple brand of products in particular are extremely trendy today, they are light and smooth and are very dynamic and clean in appearance and so, by using the materials and design features of Apple products (for example), designers are able to make their robots modern, familiar and attractive to todays audience. A good example of this is the film WALL-E. WALL-E looks like an industrial machine (grimy, bulky, gritty, rusted, muddy colours) such as a garbage truck or digger, whereas EVE looks like something from Mackintosh (sleek, shiny, rounded, clean and dynamic colours). By using the familiar features of a garbage truck and a Mackintosh, the designer is able to communicate the difference in their respective time of creation and their function but make both machines relatable to the audience.